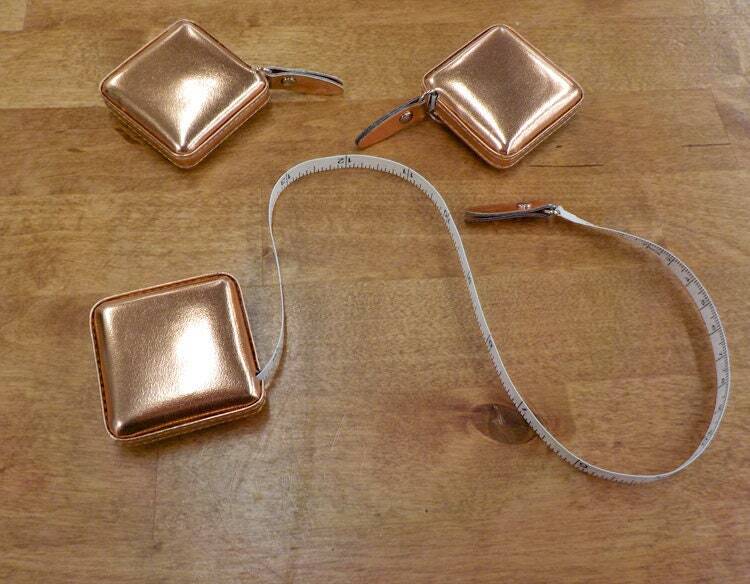 Shimmery measuring tape...Rose Gold colored. This shimmery measuring tape is soft sided and perfect for tucking into your purse or bag, sewing kit, or next to your sewing machine for quick measuring. Get started on your Rose Gold notion collection today...other notions include...embroidery scissors and thread cutter and sewing shears, small stork scissors, and thimble and lastly a medium pair of stork scissors perfect for snipping threads or triangles. Love it! Very fast shipping. So cute! Super fast shipping! Thank you! I love it. It is small and fits anywhere. Great product. This measuring tape arrived on time and as pictured. I love the rose gold color and its small size! I bought this as a gift for my friend who loves both rose gold and sewing, and she was thrilled with it. Also, this shop has wonderful customer service. I would order from again!